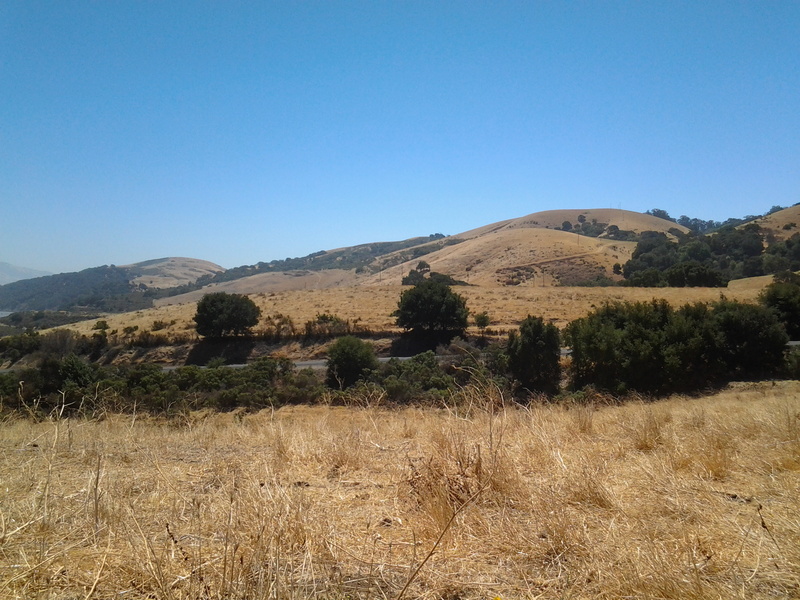 The hills of the local area in the east bay completely fascinate me. The softened edges, the distribution and pattern of oak trees in and around the valleys, the faint pathways, the textures and most hypnotically, the ever-changing color. My constant questions are: What color are the hills today? How can I mix the color and tone for those trees over there? What are the shadows doing? 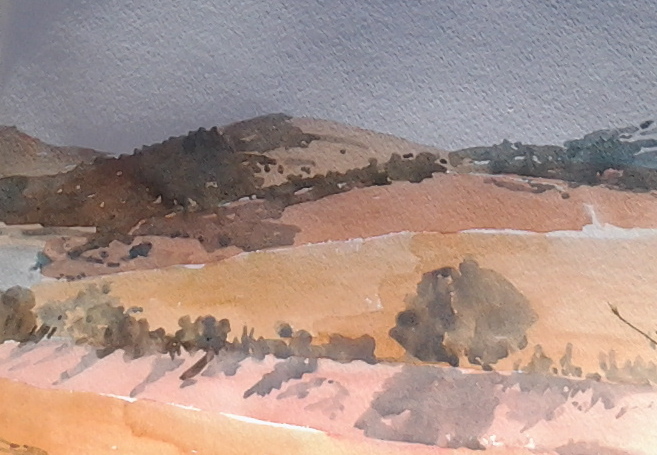 I wanted to share this little watercolor because it took maybe five minutes to paint, at the very end of a three hour painting session with friend and colleague Larry Hatfield. I was using up the existing color in my palette and working quickly to finish. What I find very interesting is that because I worked so quickly, the colors are not accurate but approximate, the composition is only a suggestion of the reality and very much a simplification. I could only get to this place of dialogue with the landscape and my rendering of it after a couple of hours of working hard to look, to consider, and to use my hand again and again to trace the contours of the hills, and try to evoke the lines and placement of vegetation. By the end of three hours, the shadows had lengthened and become very useful for the composition, and the dregs of pigment left in the palette were just enough to lay in the trees and their shadows at speed. I know that I won’t ever be able to easily recreate those 5 minutes without putting in the preliminary hours of groundwork. As Larry said the other day ‘Another lesson in humility’. This entry was posted in Uncategorized and tagged Art journal, CA., California, Crockett, East Bay, east bay landscape, Fran Osborne, Port Costa, trees, watercolors. Bookmark the permalink. This is lovely, Fran. So fresh. I’m going to organize a plein air session soon if you want to come. Port Costa might be a place to go because it has a really unusual cafe/bar (Polar Bear in a glass case for instance). I’ll keep you posted.